Banbridge Academy's Nadia Benallal. Pic by Edward Byrne. 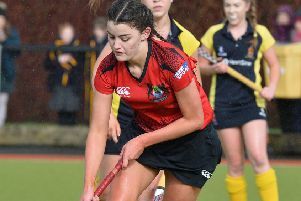 Banbridge Academy have been far from idle since lifting schoolgirls’ hockey’s Ulster Senior Cup as they prepare for this week’s all-Ireland bid in Dublin. The Ulster champions will be up against their counterparts from the other provinces today and tomorrow as they go in pursuit of a second Kate Russell Cup in three years. Nadia would dearly love to sign off her school hockey career with a second all-Ireland title, having been part of the triumphant Kate Russell Cup team two years ago. One of six survivors from the class of 2017, she is expecting a tough challenge, particularly from host team St Andrew’s, who include Ireland senior international Amy Elliott. She added: “St Andrew’s being at home and with Amy will certainly be a threat but so will holders Kilkenny College as they gave us a really hard game when we were successful in 2017. “Crescent from Limerick and Coláiste Iognaid, from Connacht are also provincial champions, so we expect four hard games. 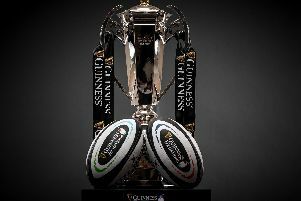 “There are no easy games at this stage as everyone will be out to pick up points. “Our coaching team will watch the other games as footage is limited but we have several different set-ups which we can adapt depending on who we play. “Our timetable is very challenging with minimal breaks in between the games but we have a good squad with strength-in-depth which we can draw upon.